Going into a new year means a fresh start. You can relax if you have a new team already in place and appointed before the end of the year. It is quicker to recruit and source talent this time of the year. With less candidates actively looking this time of year, it means less CV’s to scan, less interviews to conduct, and reduced time to appoint overall. Quality over quantity. The star candidates don’t quit… Those dedicated candidates that are actively seeking employment will not put the breaks on, and that is the dedication you want to see in your office. 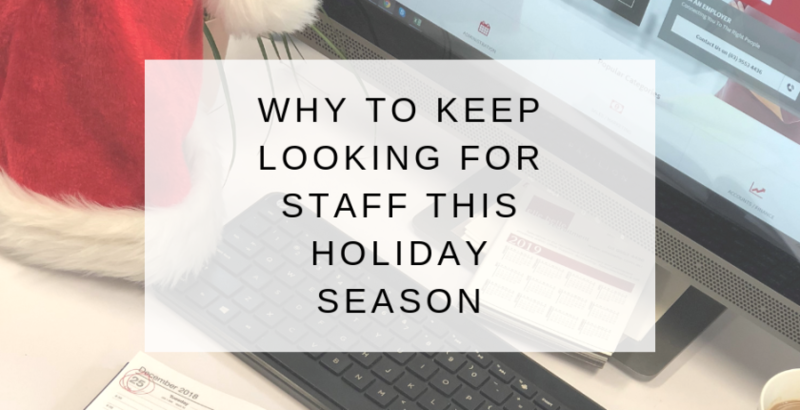 There is an increased chance that you will be able to attract passive job seekers leading up to the holiday season as their own work pressure may be reduced and the have time to focus on other possibilities and their own career development. Other companies are still hiring. Don’t let your competitors grab the top candidates. We are here to help you find that perfect team member to start in the new year, contact us today to get the ball rolling, so you can take some time to relax while we do the hard work for you.